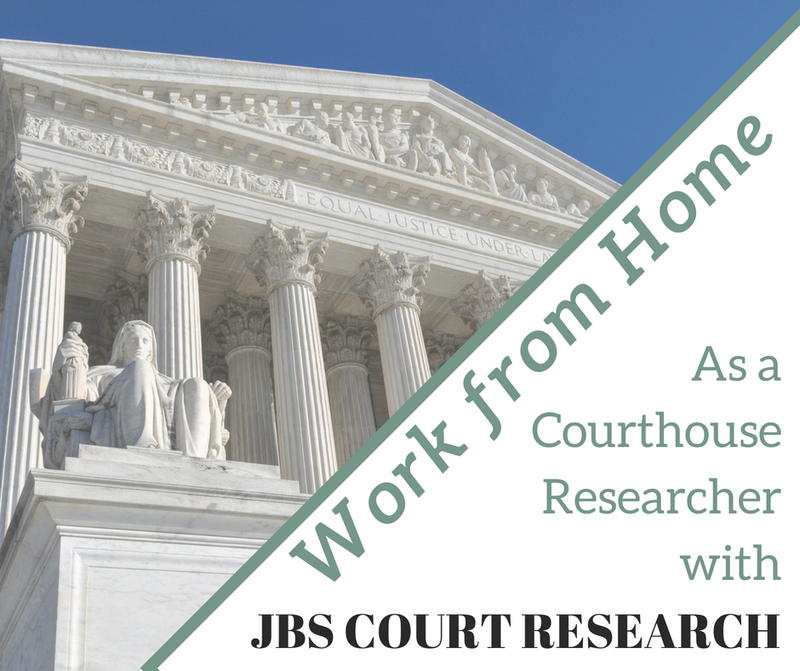 If you like flexibility, research, and being able to set your schedule, consider working for JBS Court Research as a court researcher. What is A Court Researcher? A court researcher goes to the local courthouse and looks up public documents for lawyers. You could be looking for mortgages, marriage records, tax liens, judgments, divorces, and more. This information is available to the public, so it is easy to find, but it’s busy work that most lawyers prefer hiring help for. You do the leg work, and get paid for your time. Clients hire JBS Court Research to collect public information related to filed documents, such as finding names and addresses on a lien or deed. Once the information is collected, you submit it per the instructions by the client, and then invoice for payment. In some cases, you may be able to access public court documents online, eliminating the need for a drive to the courthouse. However, to be a JBS Court Researcher, you need to be willing to drive to the courthouse to obtain the information if necessary. What is required to work for Court Research? What is JBS Court Research’s schedule? The amount of work available in a given county depends largely on the population base and growth and mobility of the area. Very small counties (i.e. 10,000 people) may have only one hour of work per month while a very large county (over 1,000,000 population) could keep a researcher busy two days/week. You are allowed to work in more than one county; however, to begin with, you’ll be assigned one county. While JBS Court Research will give you a schedule, it says it’s more of a guideline to help you get the work done. You can determine when you want to actually do the research, as long as you meet the deadlines. How much (and when and how) are court researchers paid? Once the information you’ve researched has been collected, you’ll submit it where it needs to go. At the end of the pay cycle, you’ll submit your invoice for your visit. Payment is on a per piece/record basis. JBS Court Research doesn’t indicate what the amount is, and it likely changes depending on the client and the amount and scope of the information needed. In general, court research can average from $10 to $20 per hour, but what you’ll earn will again depend on the project, as well as your experience. JBS Court Research pays once a month (the 15th) on work done the previous month. For example, work done in June, is paid July 15th. There is a straightforward application to fill out if interested. After that, the offer of a job depends on available work in your area (and surrounding areas) and your completion of the training they provide. To learn more about being a court researcher for JBS, visit its job information page, and its FAQ page.